While many argue that interpretation is more difficult than translation, I find that the two professions shouldn’t be compared. Each has its own set of skills and requires a fair amount of know-how. On the other hand, I think it is Ok for a translator to be called an interpreter even if they do not hold a degree in interpretation. It is not a double standard thing. It’s just that translation is the basis. Interpretation is, after all, a form of translation: the simultaneous one. I do not hold a degree in interpretation, but I am an interpreter and have had several interpretation assignments. Moreover, even interpreters are sometimes called translators. So, there you have it. 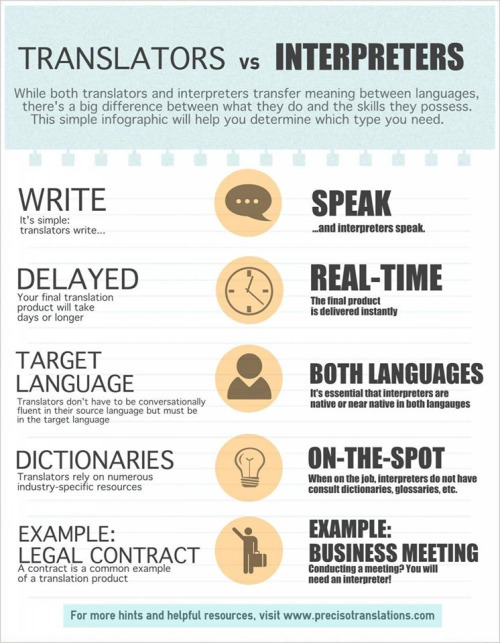 The graphic below shows the difference between a translator and an interpreter. It’s pretty accurate. While translators take their time, it doesn’t mean that interpreters are better. For example, I don’t think interpreters would do a good job interpreting a literary text. Improvising a simultaneously translated poem with rhymes and all on the spot? Boy, I’d like to see that one day! With all that was mentioned above, I must admit: I may hold a translation degree, but deep down at heart, interpretation is my passion in life! Now I will leave you with the following hilarious sketch about interpretation (simultaneous translator at a business conference). Enjoy!